I like going to art fairs. Even though a future in which I can waltz through such an event with a chequebook and pick up original art for the walls of my perfectly decorated lodgings will probably remain a fiction, it is a fantasy that I like indulging in. And sometimes I do end up buying a print, and I never regretted it. Here are some of my favourite artists from this years Artist Project Toronto. By reducing the resolution of his photographs of Toronto high-rises, McLean created a series of abstract images. The strict geometry of pixels meets that of the glass facades, while only slight variations in colour hint to the reflections of other buildings. Some look like Sim City blow-outs, others verge on the abstract. Simple, yet clever. While visually similar to McLean’s pixellated high-rises, Cantin’s film stock collages swap the digital for the analog. And it’s by zooming in, not out, that the abstract becomes real. Pavao’s medium of choice also comes in rolls. His Toronto street scenes are entirely made of pieces of tape and often capture the grittier, stickier aspects of the city. From the streets of Toronto to the realm of Canada’s singing astronaut Chris Hadfield, who reportedly owns some of Malvada’s otherworldly creations. Her acrylic planetary bodies straddle the borders between hyperrealism and the blurriness of imagination. 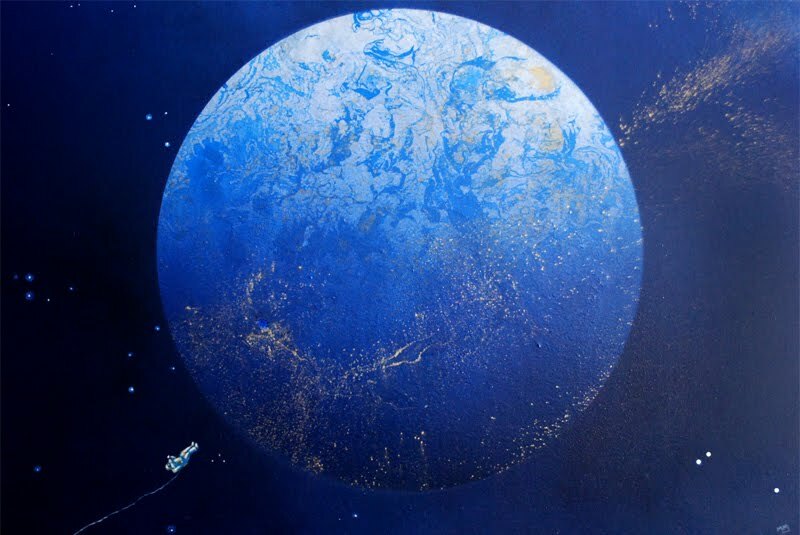 Also, they would make a great cover for the next La Planète Bleue album. Back to photography, I enjoyed Nahmias’ moody series of shuttered motels and deserted desert towns. Full circle back to reducing artwork to its constitutive pixels.